Â A few days ago I had the occasion to take my four-year-old grandson, Benjamin Henry, on the J train. I know that New York City is not responsible for the woes of the MTA.Â However, one has to ask, doesnâ€™t the Mayor have some kind of civic pride when it comes to the subway system and the stations that are part of this great city, a city he governs?Â Especially when it is the City Hall station. Benjamin and I descended down into the J station under City Hall.Â The condition of this station was unspeakable. Ben asked me very quietly, as I felt his grip on my hand grow tighter, who is in charge of the trains? MTA is a concept too difficult for a four year old to grasp so I said the Mayor. He knows his name is Bloomberg, and he began to ask all sorts of questions; what is his first name, is he married, does he have a mother and does he have children? 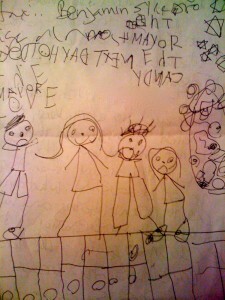 I answered him and he sat quietly as we waited for the train.Â Then he said to me that he wanted to write the mayor. I told him we would write a letter together when we got back home later that evening. I knew he was upset about the station and perhaps the letter would help? Here is the letter he dictated to me that evening. I was going with my grandma to the lower eastside to have lunch at Katzâ€™s as a treat and to meet my uncle. I live near City Hall and we walked to the train. It was the J.Â There was garbage everywhere and it smelled gross.Â I was afraid to walk because there was even throw up on the floor. It was very gross and disgusting.Â How can you let the station so close to your work be so terrible? What can we do to stop the people from throwing garbage? It is bad for the environment and the dirt is not healthy for us kids. The train did not come for a very long time and we hated being down there so grandma took me back up the stairs and we had to find a taxi. We got to lunch late but it was fun to be there. I am almost four and I have an older sister and a baby brother. Can you write me back?Â Soon. I am Benjamin ——– and I live at —–. As they say, out of the mouths of babes. All Ben wanted to know after that if the mayor was sad without a wife, I told him I didnâ€™t think so.